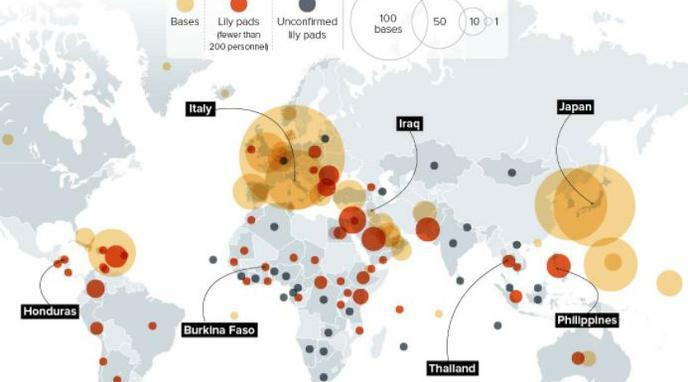 U.S. military bases around the world make the U.S. less secure. U.S. spends exorbitant amounts of money every year to maintain these bases, money much better spent on Americans in areas such as health care, infrastructure, and many other categories. The wide constellation of bases has enabled countless military strikes from Vietnam to Iraq and made it much easier for leaders to take the United States to war. Closure of US military bases would allow alternative countries like China to step in. The US is a much better actor. If the US closed all its military bases it would face the full weight of the "blowback" of its policies and would create an even more precarious security situation. The US has to keep these bases open to protect sea lanes for petroleum and other resources. If it closed them it would lose influence throughout the world and the ability to keep resources flowing that are required for business and to be a world leader. The US would lose its geo-strategic advantage in matters of war if these bases were shut down.